This is the most beautiful and technologically advanced mappack for Doom2 singleplayer. 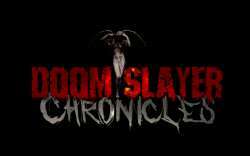 Doom Slayer Chronicles (DSC) is compatible with all known gameplay mods for Doom2. The DSC takes advantage of the newest features of gzdoom, such as hardware shaders, full-screen post-processing, PBR textures (normals and specular maps, also often called "bump mapping"), high-resolution textures, and of course dynamic lighting. It gives you two different episodes to go through, each giving you various waves of enemies. It also has a ranking system, based on how many you manage to kill. It's actually pretty darn intense with the variety of enemies as well as the audio.